Definition at line 139 of file HexagonShuffler.h. Definition at line 162 of file HexagonShuffler.h. Definition at line 199 of file HexagonShuffler.cpp. References llvm::MCSubtargetInfo::getCPU(), reset(), and llvm::HexagonCVIResource::SetupTUL(). Definition at line 212 of file HexagonShuffler.cpp. References MCII, and llvm::SmallVectorTemplateBase< T, bool >::push_back(). Definition at line 287 of file HexagonShuffler.cpp. Definition at line 180 of file HexagonShuffler.h. Referenced by check(), llvm::HexagonMCShuffler::copyTo(), restrictNoSlot1Store(), restrictSlot1AOK(), and shuffle(). Check that the packet is legal and enforce relative insn order. Definition at line 293 of file HexagonShuffler.cpp. References applySlotRestrictions(), assert(), begin(), checkHVXPipes(), llvm::SmallVectorImpl< T >::clear(), end(), first, llvm::HexagonMCInstrInfo::getDesc(), llvm::MCOperand::getInst(), llvm::MCInst::getOpcode(), llvm::MCInst::getOperand(), llvm::HexagonMCInstrInfo::getOtherReservedSlots(), llvm::HexagonMCInstrInfo::getType(), I, isBranch(), isMemReorderDisabled(), llvm::MCInstrDesc::isReturn(), jumpSlots, CVIUnits::Lanes, llvm::HexagonInstr::lessCore(), llvm::HexagonInstr::lessCVI(), LLVM_FALLTHROUGH, MAX_JUMP_SLOTS, llvm::MCInstrDesc::mayLoad(), llvm::MCInstrDesc::mayStore(), MCII, llvm::HexagonMCInstrInfo::prefersSlot3(), llvm::SmallVectorTemplateBase< T, bool >::push_back(), reportError(), second, llvm::SmallVectorBase::size(), llvm::stable_sort(), STI, stores, llvm::HexagonII::TypeALU64, llvm::HexagonII::TypeCJ, llvm::HexagonII::TypeCR, llvm::HexagonII::TypeCVI_GATHER, llvm::HexagonII::TypeCVI_GATHER_RST, llvm::HexagonII::TypeCVI_SCATTER, llvm::HexagonII::TypeCVI_SCATTER_DV, llvm::HexagonII::TypeCVI_SCATTER_NEW_RST, llvm::HexagonII::TypeCVI_SCATTER_NEW_ST, llvm::HexagonII::TypeCVI_SCATTER_RST, llvm::HexagonII::TypeCVI_VM_LD, llvm::HexagonII::TypeCVI_VM_NEW_ST, llvm::HexagonII::TypeCVI_VM_ST, llvm::HexagonII::TypeCVI_VM_STU, llvm::HexagonII::TypeCVI_VM_TMP_LD, llvm::HexagonII::TypeCVI_VM_VP_LDU, llvm::HexagonII::TypeCVI_ZW, llvm::HexagonII::TypeDUPLEX, llvm::HexagonII::TypeJ, llvm::HexagonII::TypeLD, llvm::HexagonII::TypeNCJ, llvm::HexagonII::TypeS_2op, llvm::HexagonII::TypeS_3op, llvm::HexagonII::TypeST, llvm::HexagonII::TypeV2LDST, llvm::HexagonII::TypeV4LDST, and CVIUnits::Units. Referenced by llvm::HexagonMCChecker::reportBranchErrors(), and shuffle(). Definition at line 181 of file HexagonShuffler.h. References llvm::sys::path::append(), llvm::SmallVectorTemplateCommon< T, typename >::end(), and reportError(). Definition at line 176 of file HexagonShuffler.h. Definition at line 669 of file HexagonShuffler.cpp. References AppliedRestrictions, Context, llvm::SourceMgr::DK_Note, llvm::MCContext::getSourceManager(), I, Loc, llvm::SourceMgr::PrintMessage(), llvm::MCContext::reportError(), and ReportErrors. Referenced by check(), and shuffle(). Definition at line 207 of file HexagonShuffler.cpp. References BundleFlags, and llvm::SmallVectorImpl< T >::clear(). Definition at line 256 of file HexagonShuffler.cpp. References AppliedRestrictions, begin(), end(), llvm::HexagonMCInstrInfo::getDesc(), llvm::MCInst::getLoc(), llvm::HexagonMCInstrInfo::isRestrictNoSlot1Store(), and MCII. Definition at line 225 of file HexagonShuffler.cpp. 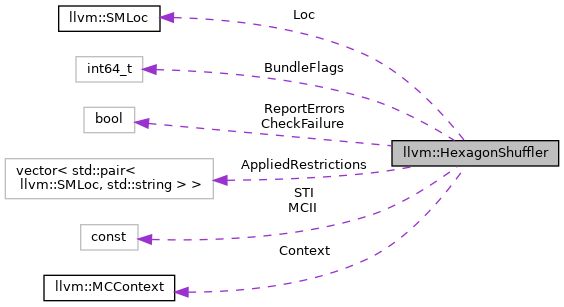 References AppliedRestrictions, begin(), end(), llvm::MCInst::getLoc(), llvm::HexagonMCInstrInfo::getType(), llvm::HexagonMCInstrInfo::isRestrictSlot1AOK(), MCII, llvm::HexagonII::TypeALU32_2op, llvm::HexagonII::TypeALU32_3op, and llvm::HexagonII::TypeALU32_ADDI. Definition at line 620 of file HexagonShuffler.cpp. References llvm::SmallVectorTemplateCommon< T, typename >::begin(), begin(), check(), llvm::dbgs(), llvm::SmallVectorTemplateCommon< T, typename >::end(), end(), llvm::HexagonMCInstrInfo::getDesc(), getOpcode(), HEXAGON_PACKET_SIZE, LLVM_DEBUG, MCII, reportError(), size(), llvm::stable_sort(), and llvm::raw_ostream::write_hex(). Definition at line 174 of file HexagonShuffler.h. Referenced by llvm::HexagonMCShuffle(), and shuffle(). Definition at line 156 of file HexagonShuffler.h. Referenced by reportError(), restrictNoSlot1Store(), and restrictSlot1AOK(). Definition at line 151 of file HexagonShuffler.h. Referenced by llvm::HexagonMCShuffler::copyTo(), and reset(). Definition at line 150 of file HexagonShuffler.h. Referenced by llvm::HexagonMCShuffler::HexagonMCShuffler(), and reportError(). Definition at line 154 of file HexagonShuffler.h. Referenced by llvm::HexagonMCShuffler::copyTo(), and reportError(). Definition at line 152 of file HexagonShuffler.h. Referenced by append(), check(), llvm::HexagonMCShuffler::HexagonMCShuffler(), restrictNoSlot1Store(), restrictSlot1AOK(), and shuffle(). Definition at line 155 of file HexagonShuffler.h. Definition at line 153 of file HexagonShuffler.h. Referenced by check(), and llvm::HexagonMCShuffler::HexagonMCShuffler().